The Great Unwinding of the central banks stimulus policies is underway, as discussed last week. Oil markets have been one of the first to feel the change, as the chart shows, with prices finally falling out of the ‘triangle’ shape built up since 2008. The value of the US$, interest rates and the S&P 500 will also be impacted as the Unwinding continues. Futures markets had originally been created to allow producers and consumers to hedge positions. The blog helped to develop the contract in its early days when working for ICI in Houston, Texas. It still believe they have a valid purpose. But as the blog noted as long ago as July 2010, the financial players’ strategy have reversed the normal working of the markets. They have created a contango structure, where prices for future delivery are higher than today’s. This is the opposite of the traditional role, where producers hedge their positions and create backwardation – making today’s price higher than tomorrow’s. Thus oil markets have thus lost their price discovery role since 2005, and have instead been swamped by financial players. History shows that the global economy cannot support oil prices being more than 2.5% of GDP. But since 2009 they have taken 5% of GDP, due to the actions of the financial players. The gap has been bridged by the central banks, creating $35tn (50% of global GDP) of new money on a low-cost basis over the period. Naturally, prices soared as all this new financial demand appeared. The reason is simple: it takes only a microsecond to create a trade on a futures market, but it takes at least 5 – 10 years to find new oilfields and bring them into production. Speculators thus began to dominate the market, creating a completely artificial balance between supply and demand – based on financial flows instead of product flows. But now the central banks are starting to pull back. Logic says you can’t go on printing money forever – in the end, you have to start paying it back, or defaulting. So the chart is telling us that the financial players are now retreating from the market. In turn, this means physical supply/demand levels will come to drive the process of price discovery once again. How low will prices go? We can have no idea, as prices have never been this high for so long. Nor can we rule out a further massive stimulus effort by the central banks at some point. But ‘technical trading’ logic would suggest they will fall to at least the 200-day exponential moving average, currently around $70/bbl, and probably lower (red line). 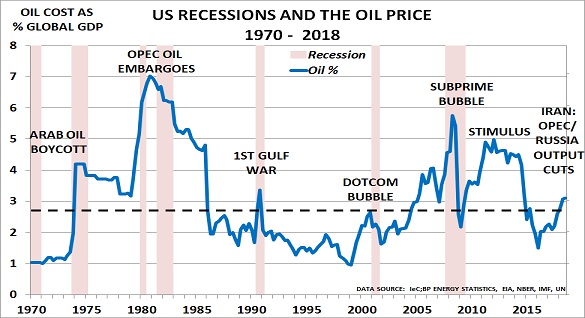 Equally, if price discovery does start to become based on real supply/demand balances again, we will have to watch out for geopolitical issues. Ironically, there was never a single moment when supplies were interupted whilst prices were high. It was all hype, as the blog described at the time. But today there are real concerns developing on the supply side. Will Russia cut Europe’s gas supply through the Ukraine in the winter, for example? That could easily push oil prices much higher, as users panicked and tried to substitute oil for gas. Companies need to urgently prepare for major and unprecedented volatility in energy markets, as the Great Unwinding continues.